Want to go snow tubing on a warm summer day? It used to be impossible, but now you can do exactly that at Pigeon Forge Snow in the Smoky Mountains! 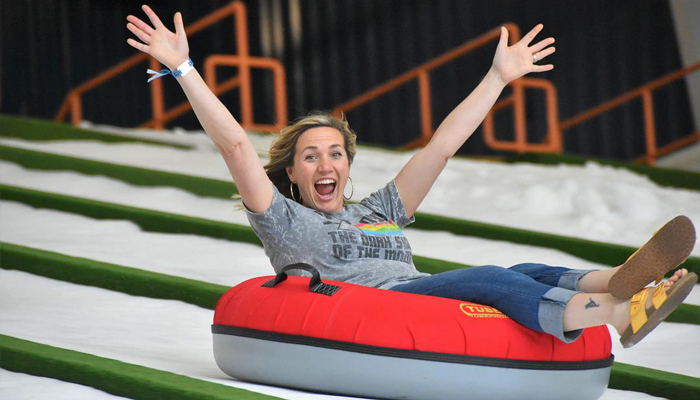 As the first indoor snow tubing attraction in the US, this new attraction in Pigeon Forge is making a big buzz in the Smokies! Here are 5 reasons to experience Pigeon Forge Snow today! One of the biggest surprises about Pigeon Forge Snow is that it uses 100% real snow! Thanks to the latest in snowmaking technology, this indoor tubing park is able to make snow with frozen water instead of using chemicals or synthetic material. They can make snow every day, so there's plenty of the white stuff for an exciting day of tubing! And with 15 lanes to tube, you won't have to wait in line to a thrilling ride. Better yet, a moving walkway takes you to the top, so it's easy to make lots of runs down the slopes! Another incredible thing about Pigeon Forge Snow is that the temperature inside the tubing building is a comfortable 60-70°F! Unlike normal outdoor tubing in the winter months, you don't have to bundle up to play in this winter wonderland! Pigeon Forge Snow does recommend wearing long sleeves and closed toe shoes for enjoying the tubing runs. Before Pigeon Forge Snow opened, the only other option for snow tubing in the Smokies were the slopes at Ober Gatlinburg Ski Mountain. Unfortunately, these tubing runs in Gatlinburg are only open for the winter season when temperatures are cold enough to make snow. But thanks to Pigeon Forge Snow, you can play in the snow any time of year. 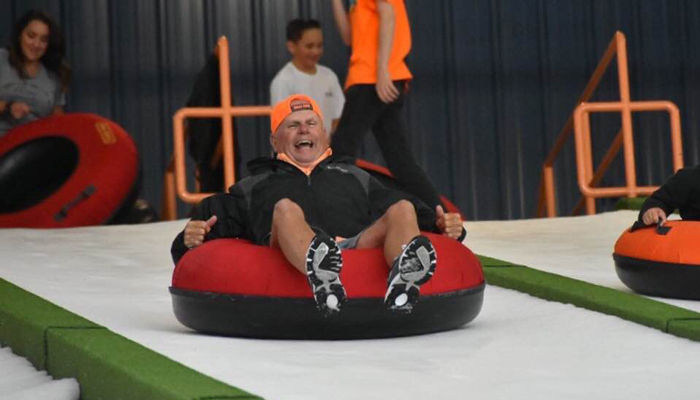 Whether it's a hot summer day or a snowy winter day, you can now go snow tubing whenever you'd like in the Smokies! Pigeon Forge Snow has more than just snow tubing! In this 35,000 Sq. Ft. facility, there's also a separate snow play area the perfect place to make a snowman or snow angels. 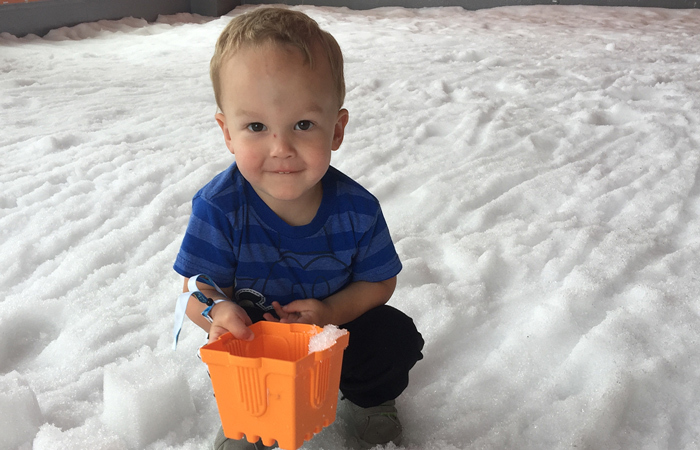 Thanks to Pigeon Forge Snow, you can have some wintertime fun even on the hottest summer day! If snow tubing isn't your thing, there's a viewing area on the 2nd level that's perfect for watching your friends and family while they tube. This area is free to use and there's also a snack bar if you need some refreshments. Here's a video of what to expect at Pigeon Forge Snow! Have you been to this new attraction in Pigeon Forge? What did you think? We'd love to hear your thoughts about it in our comment section below!